In our introductory note about National RailYatri Alert System (NRAS), we had alluded to how Indian Railways runs one of the most distributed yet heavily interconnected functional systems. Every day hundreds of announcements, events, and incidents occur on this network which has the potential to impact travel to thousands of locations – directly or indirectly – thereby affecting millions of travelers. Every running train in a network runs on a pre-determined timetable – which has been constructed and planned, keeping in mind the constraints on the infrastructure (traffic, tracks, station capacity, etc.) which it uses on the route. These constraints cause interdependencies in a railway network. This essentially means that a change in a regular schedule in one location of the network may induce a change in timetable at another location in the network (for example – a schedule change at Kanpur Central may lead to a schedule change at Secunderabad). While railway networks all around the world lean on such dependences,– this after effect is more pronounced in a heavily loaded network like Indian Railways. This effect is also known as Network Effect. Areas of Immediate Impact:The inner circle represents the areas which will have a more severe impact considering that a wider range of trains may get cancelled/rescheduled/diverted besides having significant delays on train running. NRAS considers that this area needs to be marked for immediate alerts (Now-casting). Areas of Cascading Impact:The middle circle represents the areas where the impact of this incident may be limited to smaller count of trains. This impact is expected to be more in the form of train delays and needs to be properly forecasted. 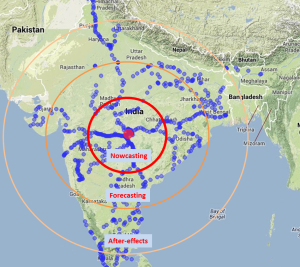 Areas of Residual Impact:Depending on the severity of the incident – the areas within or beyond the outer circle may see residual impacts (after-effects) of this incident. It is also possible that in this area the impact is because of the cascading effects of other incidents which have happened on the network. The key however is to correctly determine the radius of these circles of impacts – which may vary depending on the type or severity of the incident. NRAS gives us the flexibility to dynamically and in real-time determine these areas of impacts. Get RailYatri train app – Your best friend on a train. Next articleHow to use RailRadar™ Hotspots?